Today we’re excited to announce the addition of not 5, not 10, but 16 new button options for your IntenseDebate comment system. This project has been a long in the making, and these new styles are now available in your Layout Settings page at http://intensedebate.com/edit-site-layout. There are 4 main button styles (apart from the normal text links): Default, Candy, Glass, and Square. Each style features some color and size variations, so you should be able to find something that fits nicely with your site’s theme. This is our beloved default button that’s in use across all IntenseDebate comment sections. We’ve introduced a twist with some new size variation: you can choose to only show large buttons. Candy is the coolest of the cool when it comes to our new buttons. With 12 different color variations (in common colors ) there’s something for everyone. Our personal favorites include White, Light Blue (which is actually IntenseDebate-blue), Orange, and Green. 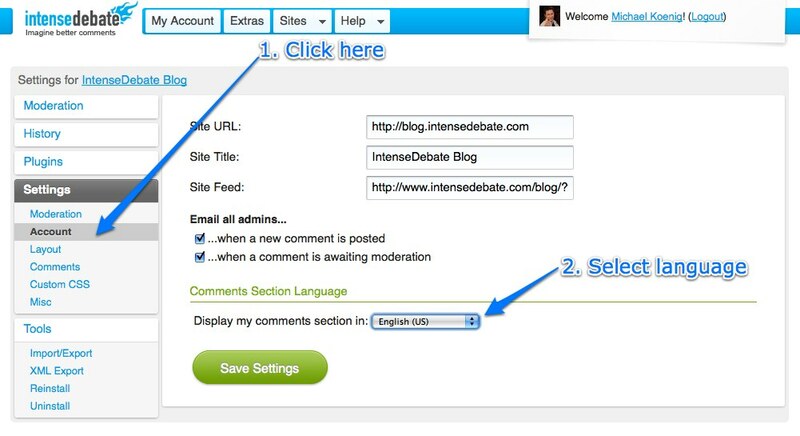 You’ll actually find a similar button design around IntenseDebate.com – that’s how much we like them! Glass is the classy choice. Available in White and Black, it’s a slick alternative to our flashy new Candy buttons. Glass buttons are designed to resemble clear or smoked glass. For those of you that might want something a bit more square, we now offer a variation to the Default buttons which features small rounded corners. It’s perfect if you don’t want your button too big, or don’t want it to stand out too much. Head on over to your Blog Layout page to check out the new buttons and activate them. IntenseDebate is now available in 24 languages: Arabic, Bulgarian, Catalan, Croatian, Czech, Danish, English, Estonian, Filipino, French, German, Italian, Lithuanian, Malay, Polish, Brazilian Portuguese, Russian, Slovak, Slovene, Latin American Spanish, European Spanish, Swedish, Turkish, and Ukrainian. And there are more on the way! These translations are available in your Blog Settings page at http://intensedebate.com/editacct. Don’t see your language? Give us a hand! If you’re interested in getting involved, now is the perfect time! Please email us at labs@intensedebate.com for information. Thanks! IntenseDebate is now available in 20 languages: Arabic, Bulgarian, Catalan, Croatian, English, Estonian, Filipino, French, German, Italian, Lithuanian, Malay, Polish, Brazilian Portuguese, Russian, Slovak, Slovene, Latin American Spanish, European Spanish, and Ukrainian. And there are more on the way! These translations are available in your Blog Settings page at IntenseDebate.com. If you’re interested in getting involved, now is the perfect time! Please email us at labs@intensedebate.com for information. Ideally we’d like to have at least two Iñtërnâtiônàlizætiønër’s working together for each translation. Thanks! A little while back we opened up IntenseDebate for localization, and we received over 100 volunteers to help translate IntenseDebate to 43 languages. Within a couple of weeks we were able to launch translations for 11 languages: Arabic, Croatian, Filipino, French, German, Malay, Brazilian Portuguese, Russian, Latin American Spanish, European Spanish, and Ukrainian. This week we’re excited to release 6 additional translations.